Operations have also resulted in the seizure of hundreds of thousands of euro in cash. Jewelry and cash seized by gardaí in 2016. GARDAÍ HAVE SEIZED nearly €95,000 worth of jewellery from members of the Kinahan cartel since the crackdown on the gang began. Operations Thistle and Hybrid have been working on disrupting the Kinahan cartel by investigating senior members of the criminal enterprise. The Criminal Assets Bureau (CAB) has been involved in searching the businesses and homes of those they believe have accumulated wealth from the proceeds of crime. In addition to the seizures and checkpoints, gardaí are still maintaining a significant presence at Dublin Port. They are working with their partners in Revenue and Customs in a bid to catch consignments of drugs coming from Europe. In relation to active murder investigations, gardaí have made 77 arrests, searched 236 premises, charged 14 people, seized 24 guns and completed 11,456 investigative tasks. Email “Gardaí have seized nearly €95k in jewellery linked to the Kinahan cartel”. 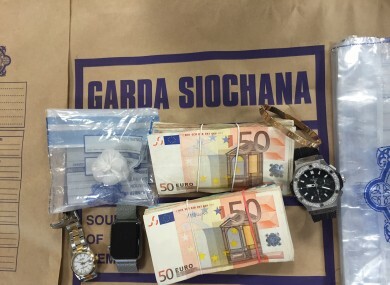 Feedback on “Gardaí have seized nearly €95k in jewellery linked to the Kinahan cartel”.